Call us at (833) 588-4822 for immediate assistance. Fill out the schedule form below and we’ll contact you back to confirm your appointment time. If you are in need of emergency service, please call us at (833) 588-4822. Automatic Climate has been serving Central Virginia’s air conditioning, heating, Air Duct, Electrical & Plumbing needs since 1983. Our mission is to keep your family home comfortable all year long. Quality service and dependability is the driving force that guides our company. We always strive to give our customers the highest level of service. Automatic Climate: Richmond Virginia’s #1 HVAC Company – rated by Customers on Google, Angie’s List, Yelp & The BBB. 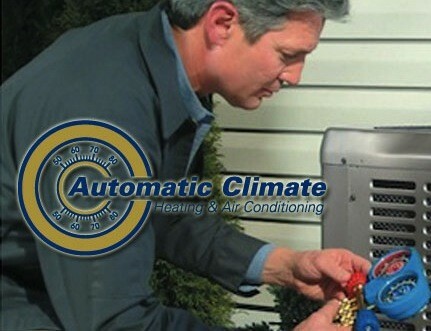 Automatic Climate is a Richmond-based, family-owned and operated company that has served Central Virginia since 1983. We hire personable and competent, NATE certified service technicians and provide regular training to all our staff, so you receive the best service possible. Call us today at (804) 276-5127 to set up an appointment, share a success story with us or help us continue to improve our service. It’s very rare that we need to come back and fix a problem. But, if any part we repair doesn’t work or breaks, we’ll come back and replace the part free of charge for one year. At Automatic Climate, we know that HVAC heating and air conditioning systems don’t just work from 9am to 5pm. So why would your HVAC AC heating and air conditioning company? We’re even available 24-7 for emergency services. Automatic Climate is proud to be the highest rated by our Customers on sites such as Google Plus, Angie’s List, Yelp & The BBB. we have won the Angie's List Super Service award in all HVAC, Plumbing and Electrical categories since 2010. Service Area: Richmond Virginia & Surrounding Areas Including Williamsburg Locations.